Do people still think about American Graffiti? --- because it seemed huge in 1973-74. I watched again last night for a first time in years, realized that the expanded reissue has become the "official" version, so we're close on two hours. Books tell that American Graffiti is among most profitable films ever made, a windfall for Universal. Done for cheap, as in under a million, many times that coming back (the gross over a hundred million). 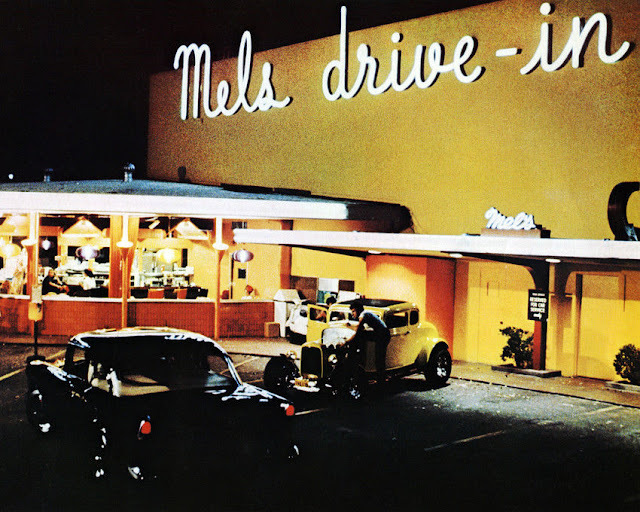 I wonder if American Graffiti was what made Hollywood realize outlandish money that could still be made off movies. Huge earning went up and up from there, to Jaws, and then Star Wars. Between these came The Sting, also Universal. We could wonder who actually took home remarkable gains off American Graffiti. From watcher's P.O.V., you'd think creative hands should get lion's share, those like producing Francis Coppola, writing director George Lucas, other scribes involved, but history says they got less than we'd expect, Universal the big shark that ate money. Phenomena like American Graffiti explains how studio exec salaries went stratospheric during that era. 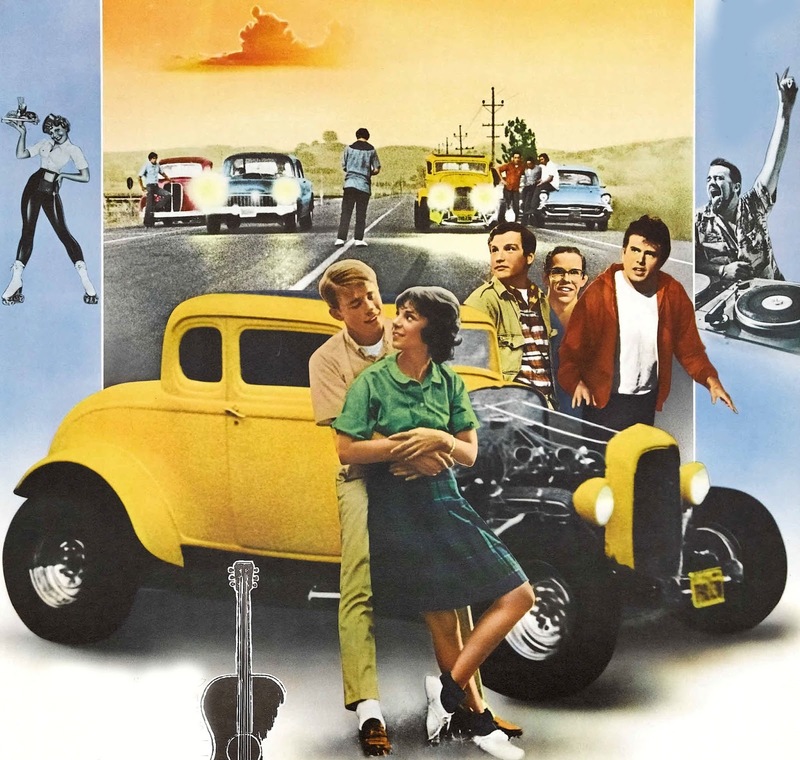 Should American Graffiti take credit for massive revive of early rock and roll in the 70's? Were record anthologies and comeback of old acts borne on Graffiti wings? There weren't many D.J's like Wolfman Jack by 1973, at least none with latitude he seems to enjoy in American Graffiti. Radio was long stratified by play lists and jocks as cogs by then, so the Wolfman must have seemed more historical figure than acts he spun through all-night depicted in the film. Wolfman Jack went from minor figure to Iron Eyes Cody of the disc-spinners with American Graffiti. What was left of the 70's saw him everywhere. 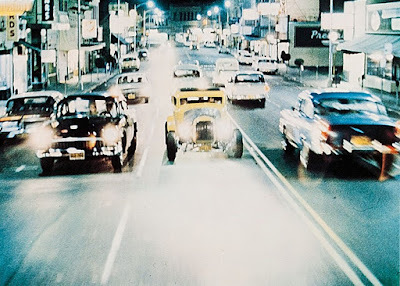 Wolfman gets great on-camera reveal near the end, maybe a richest moment in American Graffiti. Remarkable is fact that contemporaries of his, guys who started in the 50's on radio, are still doing air shifts for Sirius, their listeners worldwide. Cousin Brucie (Bruce Morrow) comes to mind. He began in 1959, still at it today, the voice a same as when he broadcast from the Beatles hotel suite when they first came to America. What history this man represents. I hope music historians got it all down, though you wonder how Cuz would find time to do much looking back. Interesting is fact Wolfman Jack went head-to-head with Cousin Brucie on competing NYC stations right when American Graffiti opened in 1973. Both got huge boost from nostalgia detonated by the movie. 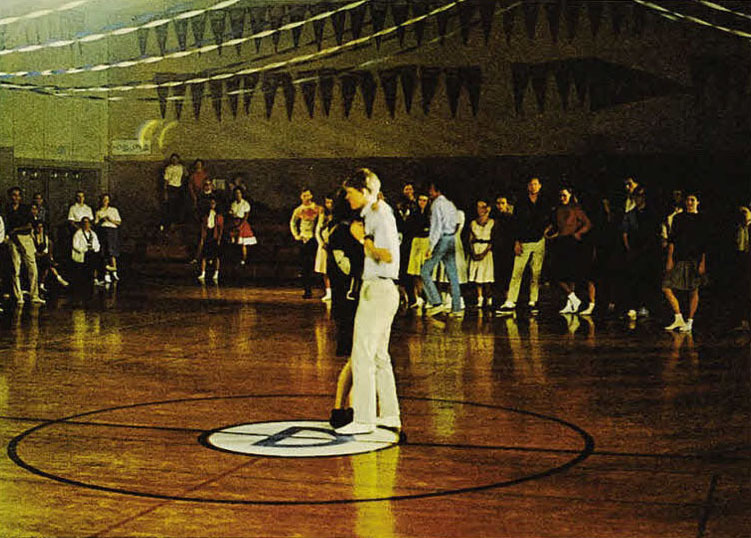 Did the old rock and roll seen new to young people in 1973? I don't recall hearing a lot of it. R&R had mostly become "rock" by then, served on FM radio in eight or nine minute album cuts, fun (for me) having bled off much of pop music. Harder edge saw volumes louder and theatres doing midnight run of Woodstock that had staff pulling plow past 3 AM. My college got in-concert Flash Cadillac and The Continental Kids, fresh off American Graffiti ... I should have inquired if classmates found them cool or quaint. The 50's revival tapped into everyone wanting to be young again, or stay that way, a malady still in force. Later it was counterculture 60's they all wanted to relive. I'm still waiting for that mindset to go away. Standards we'd hear at gas stations and super markets was swing from the 40's, then pop from the 50's. Now it seems the 70's are where elevators are at. 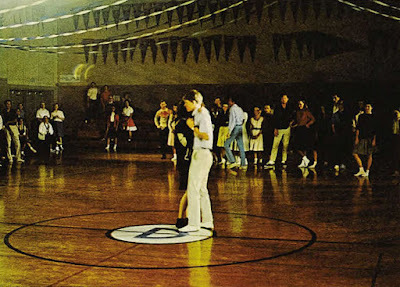 I can't fill my tank or walk through the YMCA without background of the Spinners or Saturday In The Park. Question is, who's listening to those nine minute album cuts from 1973? American Graffiti could be read as look-back fun, innocence we'd lost, whatever. There was chock-load of young players to tote movie and TV load for a decade ahead. My objection at the time was Ronny Howard to Opie-fy what was otherwise fresh casting, him bearing taint of Andy Griffith in fallen later seasons and lagger that was The Smith Family on ABC. End credit tally of fate awaiting Graffiti characters might as profitably be applied to actors playing them, ones who'd thrive vs. those to flash, then burn or sell autographs at the Beverly Garland Hotel on 90's weekends (do they still?). Maybe there are those nostalgic for American Graffiti itself, revisits a chance to relive 70's life that was simpler. Or maybe American Graffiti is more like The Longest Yard or others of impermanence, as in one had to be there to appreciate how meaningful they were. I was invited by Universal in Toronto to an advance screening of this. It blew my socks off. Laughed so hard I was almost in pain. 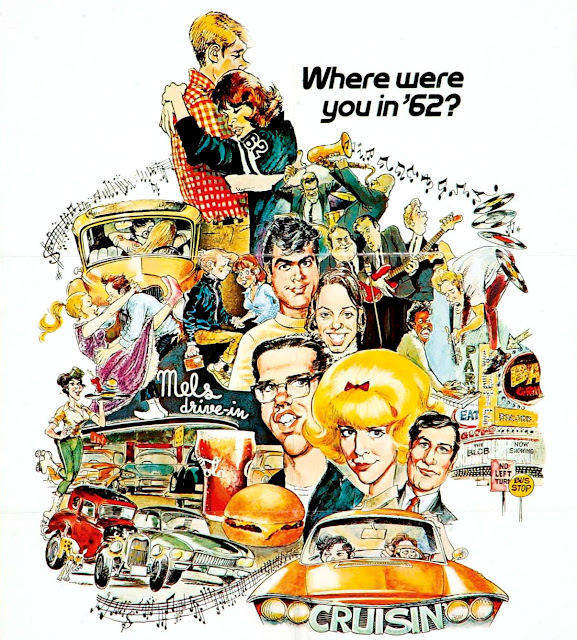 American Graffiti, Animal House, Grease, Happy Days ... the cornerstones of the mock nostalgia wave, films and shows mostly targeting an audience just a little too young to have experienced it (although Broadway's 1972 "Grease" aimed much of its humor at theatergoers who DID experience the 50s). Contemporary youth managed to simultaneously mock and embrace the music, fashion, and attitudes of "a more innocent time". They often meant "a time that was really swell if you lucked into a very specific life where you didn't have to worry about stuff". "Real" nostalgia seemed a bit more academic: oldsters talking about the virtues manifested during the Depression and WWII, or sentimental period romcoms that presaged Disneyland's gingerbread Main Street. I get the impression that youth of the first half of the century were eager to mock and abandon the accouterments of their parents' era. Period books and films might be popular, but they were more than a generation or so distant and didn't inspire youthful emulation. Of course I'm very possibly wrong here. It's hard to imagine kids of the 20s, 30s or 40s indulging in mock nostalgia for the previous decade (they might embrace "the old west", but that's a different animal). I always question the nostalgia fad. In fact the only nostalgia I care about is the tango NOSTALGIAS by Juan Carlos Cobián and Enrique Cadícamo performed by Charlo in 1936. I managed to see AMERICAN GRAFFITI being already an adult 20 years after its release and for that reason I felt no nostalgic about it but I enjoyed it. I did manage to see a few "nostalgic" films from Argentina that evoked the dictatorship of the seventies and for the most part, I hated all of them. They gave a superficial, biased and incomplete experience of certain things that I partially witnessed myself as a child. The only nostalgic feelings I have are related to some tango orchestras that I couldn't experience live. To make things worse, some of them were not even filmed. In 1973 I rode the subway every day to my Brooklyn high school. Climbing up the steps into the sunlight, on the kiosk signboard was a poster for AMERICAN GRAFFITI. Under its tagline "Where were you in '62?" someone had written in magic marker, "IN A CRADLE, YOU DOPE" That's my nostalgic memory of AMERICAN GRAFFITI. But does anyone remember the sequel "More American Graffiti"? I seemed to have been the only one who enjoyed it at the time. There was enough thought put into it, creatively and technically, to make it more than just a quickie cash-in. Perhaps people who loved the simplicity and innocence of the first were turned off by the realism -- Vietnam, marital discord, etc. -- of the second. It's worthy of a second look, if my memory is accurate. I did see the sequel on TV... in the Latin American version of TNT. It was a very strange choice movie to air, which they did rather frequently in those days around 1994. The version was, partially, dubbed in Spanish which means that many sequences were originally cut for television distribution. On TNT, the movie played uncut with those scenes running in English. But there was nothing questionable in those fragments but just split screen effects that were retained in the original scope in the telecine. As you said it is probably worthy of a second look (despite trying to be more realistic the characters remained the same) even in that bizarre version I had to see. Columbia, ever on the lookout for a quick exploitation opportunity, cashed in with a rock-'n'-roll documentary, LET THE GOOD TIMES ROLL. This was mostly a concert film of '50s stars onstage and backstage, working the oldies circuit in 1973. The theatrical presentation had occasional panels of archive footage alongside the new footage. I thought Columbia might have packaged this with a reissue of ROCK AROUND THE CLOCK, but not at my neighborhood theater... the second feature was a Columbia B, STAND UP AND BE COUNTED, which looked to me like a Screen Gems TV-movie released theatrically as the "first Women's Lib movie." Very strange double bill! 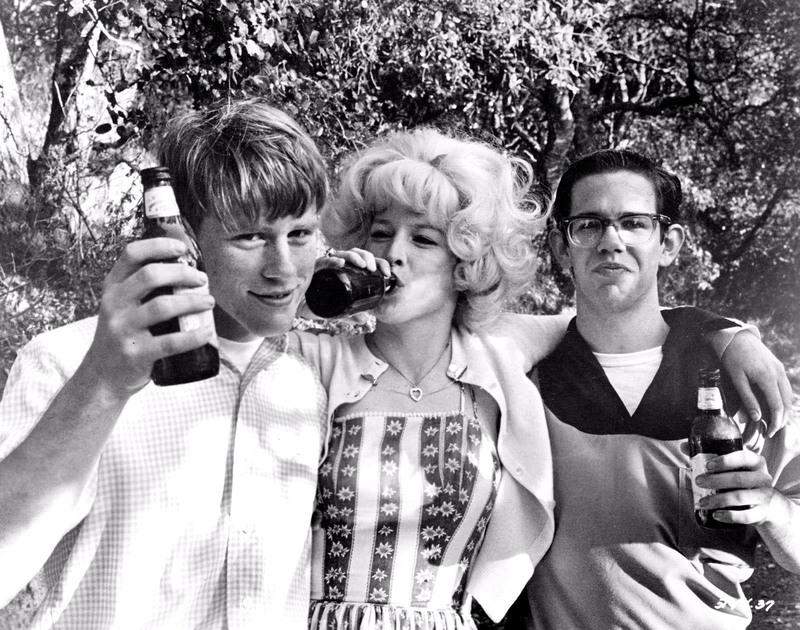 Lucas sold Universal on picking up American Graffiti at the perfect time. I think you can argue the nostalgia wave started in 1969 with Sha-Na-Na at Woodstock. Their screen time was limited, but made the soundtrack album. Then you had the stage version of GREASE becoming a hit in 1972. Maybe it was people's post-Vietnam desire to go back to a time before they ever thought about that part of the world. Outside of film, you had the Beach Boys still plugging away but seeing live albums of their old stuff selling better than the new material. Rick Nelson returned to the charts with Garden Party, a song about his experience playing a festival of his fellow 1955 to 1964 chart toppers at Madison Square Garden. Chuck Berry hit #1 with My-Ding-A-Ling in 1972 off an album that included live versions of his 50s hits. Robert Klein released his first album "A Child of the Fifties." Collecting comic books from the 40s and 50s became more popular. If anything, Universal probably saw it as a chance to cash in before the fad burned out. Instead, the movie re-energized it, giving us Happy Days and its TV clones, The Lords of Flatbush and more Baby Boomer navel gazing. 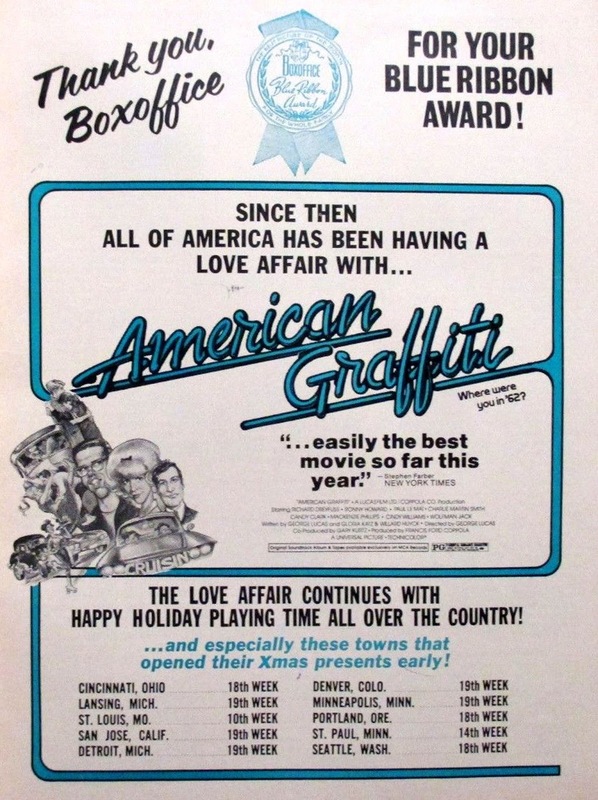 Probably a big mover of the craze was the release of the American Graffiti soundtrack album. Which was really a collection of the chart toppers of the era the film is set in. I remember reading somewhere that Lucas says that his biggest influence on the film was the getting the songs to included on the film's soundtrack. It is a good collection of songs, which could be perceived as opposition to the disco craze also in place at the time. Soon after, many radio stations adapted an "oldies" format. At this time here in Portland, Oregon there was a major "cruising" scene through the heart of downtown Portland that had been going on since the late forties, or even earlier. Some friends of my folks said that the scene as shown in the movie had been going on in their home town back in Idaho in the forties. And I had some friends who had moved to Portland from the Medford area in Southern Oregon, who said that that same scene was still going on there. Lucas may not have been paid much for this movie but it made it possible for him to realize his dream space opera movie project.And as for the cast in this movie and their careers,I'm reminded of the war movies that came out in the late 1940's with ensemble casts of actors you would see on television for the next thirty years. And finally, I've always liked the nuance for this film, Dreyfuss' character visits his old school locker, and tries the combination. It of course doesn't work. The melting ice cream at the radio station. That choice the characters have to make between leaving or staying. Which makes me wonder about what input Lucas had on this film, because there seems to be little of this same nuance in his Star Wars movies. Just to be a brat I'll sometime ask, what ever happen to the director of American Graffiti? I have always thought the idea of nostalgia to be hooey. People live in the now like every other critter on the planet tho we tend to get out of the now by worrying about the future or about guilt over the past both of which beings things we have no control over. We like to come up with theories about why some things are popular while others are not but the theories are hot air. Deems Taylor put it best, "The history of music has always been that the theorists of each generation study and make rules out of the work of the previous generation which did not know it was making rules." That applies across the board to all the arts, history, politics, religion, you name it. Jesus says, "The truth will set you free." Then along comes Christianity to create rules and regulations. Alfred A. Knopf. Notes M.F.A. 's: Master of Fine Arts degrees. I know where I was in 1973 when "American Graffiti" came out. I was sitting in the Terrace Theater in Hickory, watching it with someone dear to me. I realized even then, however, that the nostalgia played upon by the movie, was not mine, at least not of my life in the time that was its setting. I was a child then, far removed from the sense of community that is really at the heart of the story. This feeling of familiarity and oneness--of being among family and friends, acquaintances, teachers--or the gathering places where one would meet them--the neighborhood streets and play grounds, church and school, shops and theaters--was scarcely limned upon my life, so turned within was I. The shared experiences of growing up--the latest song, the new movie opening, the big game--were not mine. There must be things remembered, in order for there to be nostalgia for them. Even so, I understood the poignancy of the characters as they left this time and place in their lives. As I sat there in the theater, my hand lightly touching hers, I realized that the evening idealized in this movie, with all that it meant, was what I'd at last found myself, coming to the college of this little town and rejoining the line of my life with that of another world. Such a moment's realization would itself be fixed in time, a coda to times past from which the rest of my life would be a ceaseless leaving, though one I would return to again and again in memory. In the summer of 1973 I was nineteen and managing (some would say mismanaging) a movie theater in my hometown, when I held a private midnight showing of AMERICAN GRAFFITI for a group of my friends, many of whom were bound for college in the coming fall, including myself. We were a motley band of mostly pimply-faced lads and an adventurous young lady or two, with burgeoning drug and drinking addictions, cramming our bellies full of Schlitz beer -- and free popcorn and candy bars that were requisitioned from the unmanned snack bar, while the business owner slept peacefully in his bed, none the wiser. As heirs to the future we felt the divine right of kings; the world was indeed our oyster. The characters in this wonderful coming-of-age film seemed to capture all the fears and expectations that paralleled our own lives with an uncanny sense of synchronicity that was palpable. We were all quite giddy by the time we staggered out of the auditorium after two o'clock in the AM, somewhat transformed by the experience. 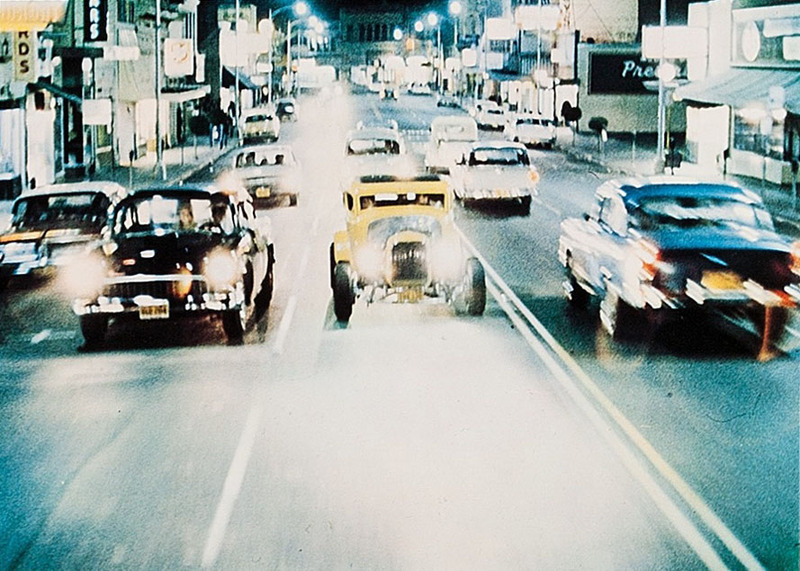 AMERICAN GRAFFITI was a mirror that we held up to our faces and saw ourselves from within.